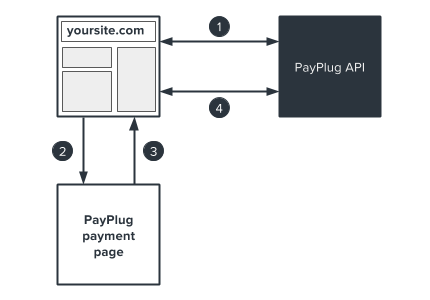 Create the payment; a link to a payment page will be generated. After entering card details, your customer is automatically redirected to the return page on your site. PayPlug sends you a confirmation via IPN (Instant Payment Notification). IMPORTANT: Please note that all amounts must be expressed in centimes as positive whole numbers (1€ = 100 centimes). When creating a payment, you can specify a notification URL for use with IPN: notification_url. Whether the payment is successful or is fails, a POST query containing an object corresponding to the payment will be sent to your server. The notification URL must be publicly accessible via the internet. It will not work if you are operating offline or if the page is protected with a firewall or proxy. Metadata allow you to include additional information when processing payments or refunds. You can add up to ten keys. Names cannot exceed twenty (20) characters, and stored content cannot exceed five hundred (500) characters. Create a refund using the payment ID of the payment you wish to refund. In order to process a refund, you will need the payment ID of the payment you wish to refund. The example above includes metadata useful in tracking the refund. If you specified a notification URL for use with IPN when the payment was created, after the refund is processed, a POST query containing an object corresponding to the refund will be sent to your server using the provided URL. The notification URL must be publicly accessible via the internet. It will not work if you are operating offline or if the page is protected with a firewall or proxy. Step one is the same as in the first diagram. and stored content cannot exceed five hundred (500) characters.